I have become quite a fan of writing home and decor posts here on my blog lately and although we aren’t currently doing much to our home due to our huge expense on the Kitchen that hasn’t stopped me from dreaming and plotting the next changes, I’ve got my living room and bathroom in mind that being said I do need to win the lottery first so rather than making my husband go crazy I thought I’d come on here to express my ideas and first room I’m going to talk about is the bathroom. 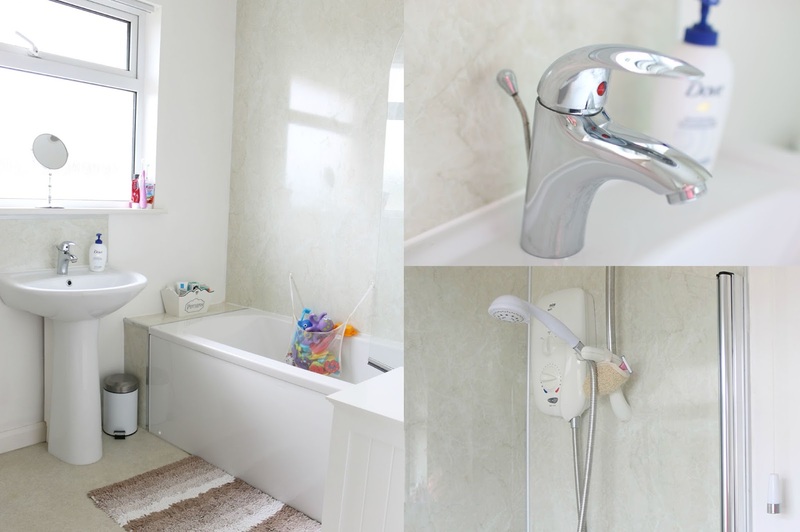 When we moved into our home 2 years ago we knew we were going to have to change a few things with regards to decor, the bathroom was one of the rooms we were generally quite happy with it has a neutral and clean appearance, the previous owners had taken care of it. Although it wasn’t quite my style I thought we’d stick with it until we had finished everything else we needed to do in the house, fast forward two years and I’m ready to get stuck in and update our bathroom to something a little more modern and contemporary it’s currently OK but I want it to have the WOW factor and of course this will make me want to do more posts such as skin care routines, daily routines ect… us bloggers have lots to post about and surprisingly I could get many posts that would feature my bathroom plus I’d have another place to take pretty product blog photos! I want our whole house to come together and for each room to have lovely modern vibe with a fresh bright feel to it. You all have seen my kitchen and how we transformed it from dull and dated to bright and airy and I have to admit that is my favourite room in the house and I’d like my bathroom to have the same feel. Being a mum having a lovely bubble bath at the end of a busy, hectic day is one of the best feelings and having somewhere to relax in peace is also just bliss. I do enjoy having a bath but I’m currently surrounded by kids bath toys and products everywhere and I’d like to change that for a more relaxing, luxurious vibe like I’m in a 5 star hotel! Our current bathroom lacks storage which makes it very difficult for me to keep things looking neat and tidy, I currently store a lot of our bathroom products in the cupboard on our landing because we just don’t have the space in our bathroom. I don’t mind having a smaller bathroom I just would like to make more use of the space we have by including furniture that has storage like under the sink for example, that would be a huge help. I’d also love a new bath, our current bath has a huge crack in it from where Vinny threw a toy at it accidentally, it also has lots of scuffs and marks from all of his bath toys. I’ve taken a look on BigBathroomShop and have come across these three suites, all of which I absolutely adore the clean lines and modern twist to each suite just gets me so excited to one day have a new bathroom like this. My favourites are: Ultra Design Showerbath Suite this is my ultimate favourite I love the storage and the overall look, Ultra Lux Bathroom Suite again so luxurious and gorgeous and lastly Milano Drake Vanity Shower Bath Suite this again has the storage we need and it’s such a great price too. All of these suites would be an essential my ideal bathroom with added gorgeous taps and shower! I think the shower fittings and taps also need to be on point, ours are currently super dated and not what I see when I think of a modern bathroom. I also took a look at TileMountain for tiles and gosh I could look for hours, we don’t have any tiles in our bathroom at the moment which I really miss. I finally whittled it down to my favourite three which are; Velvet White Wall Tile, I really love the linen effect finish of these tiles they look very contemporary and although they are just white I think they’d look amazing with a sparkling new suite. I also love the Quartz Stone Grey Tiles, ooh these are so pretty! When we were doing our kitchen I actually wanted sparkly worktops and Mark said no so having a bit of sparkle in our bathroom would fulfil my girly needs! Lastly I chose the Tones White Wall Tile, this is a very simple tile that I thought would look fantastic on the walls with the Quartz Stone tiles on the floor, how fabulous would that look! I have so many ideas and would love some help redesigning my bathroom into something spectacular, how amazing would it be to take you on our journey to creating a fabulous new bathroom like we did with our kitchen? Kitchen post here; The Before, The After! If you’d like to take a look at My Dream Bathroom then I’ve created a Pinterest Board of my favourite suites and tiles from TileMountain and BigBathroomShop, I promise you will want a new bathroom once you see this! Sorry, not sorry! Follow Liza Prideaux’s board My Dream Bathroom on Pinterest. I have also created a short video for you to show you my bathroom and close ups of things I’d like to change which is pretty much everything! What would you change in your bathroom or do you have your dream bathroom already? *Competition Entry, wish me luck! If I win I’d love to give you all a house tour once the bathroom is complete on my YouTube channel.